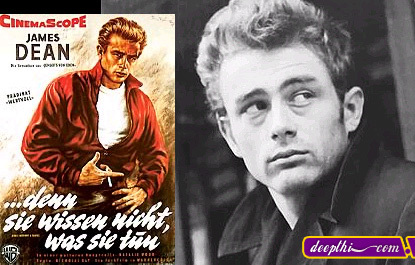 Born during the Depression of the 1930's, James Dean's early life seems unaffected by the squalor many who lived during this period of time experienced. Where entire families traveled across the country looking for any prospect of a job they could find, the Dean's were considerably more stable as Winton Dean, Jimmy's father, worked for the governent as a dentist, first in Marion, Indiana (Jimmy's birthplace) and then in West Hollywood, California. Jimmy's early years are significant in that his mother, Mildred, was alive and gave him the love and the dreams that would drive Jimmy for the rest of his life. He was killed in a road crash (30 Sep 1955) while driving his Porsche to compete in a racing event. He became a cult figure, and for many years after his death remained a symbol of youthful alienation and rebellion.